Valeryan’s new album of all original songs has finally appeared on her I-TUNES page after numerous set backs and false dawns – just in time for Christmas! Click on the link below and take a listen? There’s a song there for everyone ….. thought provoking, sad, happy ….. and a style for everyone ranging through pop, blues, rock, country and even almost classical. Click Here to buy this album! JULY 14 was finally sent to I-TUNES two weeks ago by our distributors One Media at Pinewood Studios in Middlesex. Thanks guys! JULY 14’s been sent to I-TUNES but no one as yet has the faintest idea when the live date will be! This is giving us a tiny bit of a problem – knowing when to start the pre release publicity programme … again …..
Don’t you just love this crazy music business! JULY 14 has 12 tracks , 11 are written by Valeryan and the 12th one, Still Remembering, is a collaboration with guitarist Mike Coombs a friend from way back. Mike wrote and recorded the original tune in Norfolk as Remembering and sent his track to Valeryan in Herefordshire where she wrote the lyric and vocal line, adding this to his original playing. 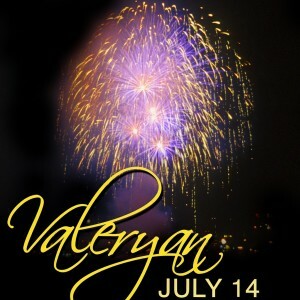 New album JULY 14 from VALERYAN should be available for download from I-TUNES in a few weeks time. Hear teasers from the tracks by clicking on the links … Enjoy!